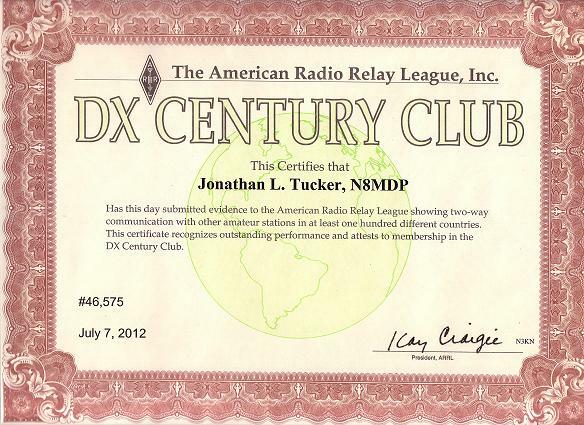 After many years of working stations around the world, I finally achieved DXCC. I accomplished this using Logbook of The World confirmations. Thanks to all of the 100 amateurs who confirmed with me to achieve this award. This was an award offered by Ham Radio Nation some time ago. This is for working 100 different countries on any band and mode. This was an award offered by Ham Radio Nation some time ago. This is for working 75 different countries on any band and mode. This was an award offered by Ham Radio Nation some time ago. This is for working 50 different countries on any band and mode. This was an award offered by Ham Radio Nation some time ago. This is for working 25 different countries on any band and mode. This was an award offered by Ham Radio Nation some time ago. 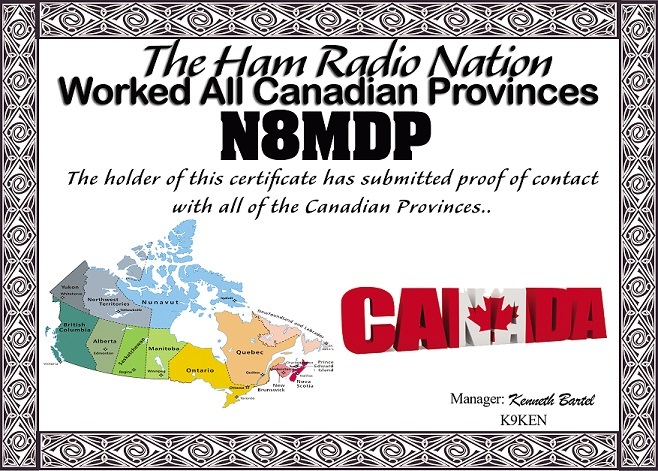 This is for working all Canadian Provinces on any band and mode. This was an award offered by Ham Radio Nation some time ago. This is for working all continents on 10 Meters, SSB Mode. This was an award offered by Ham Radio Nation some time ago. 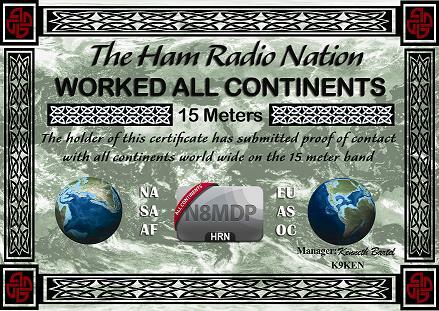 This is for working all continents on 15 Meters, SSB Mode. This was an award offered by Ham Radio Nation some time ago. 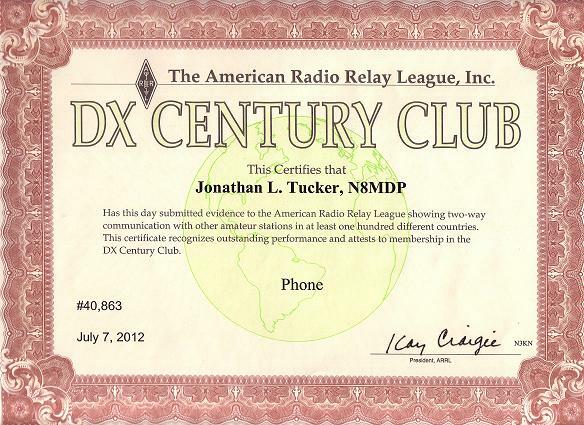 This is for working all continents on 20 Meters, SSB Mode. This is an award offered by the ARRL(www.arrl.org). This is for working all 50 states on any band using CW, Phone, and Digital. This is an award that was offered by the ARRL(www.arrl.org). 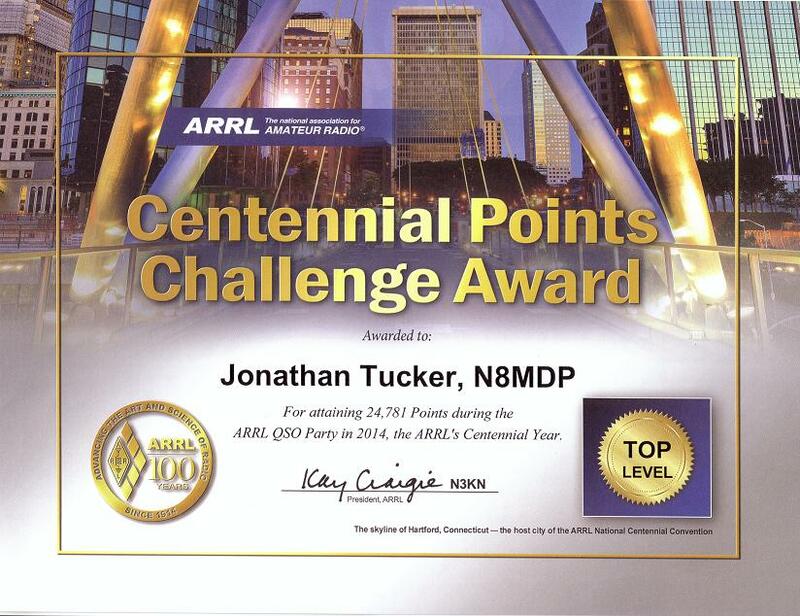 This is for the level of points I earned during the Centennial QSO Party in 2014. 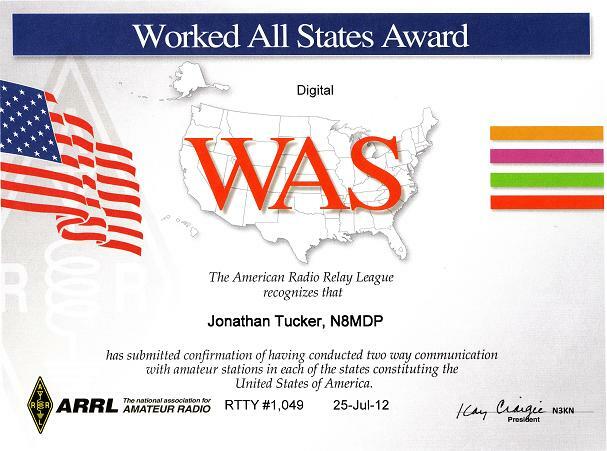 This is an award offered by the ARRL(www.arrl.org). This is for working all 50 states on any band and mode. 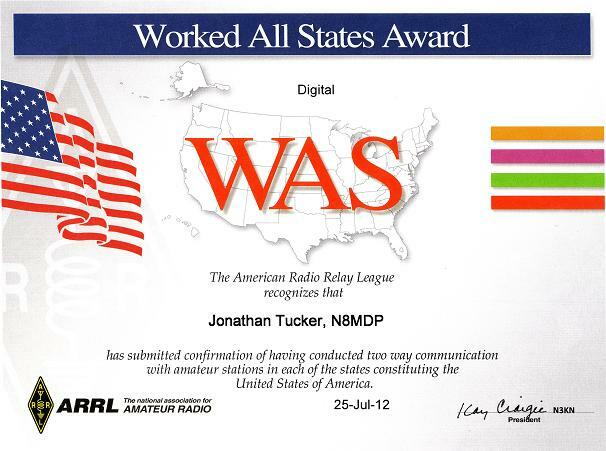 This is an award offered by the ARRL(www.arrl.org). This is for working all 50 states on any band and using a digital mode. 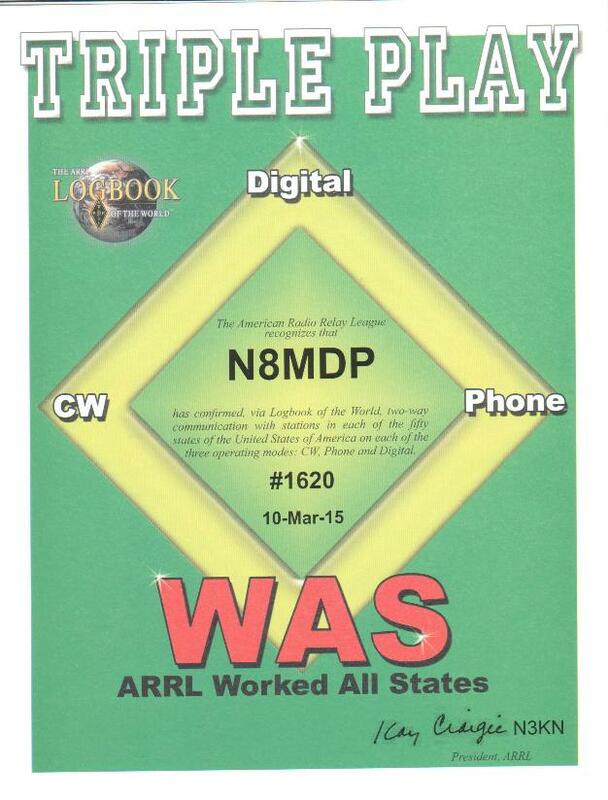 This is an award that was offered by the ARRL(www.arrl.org). 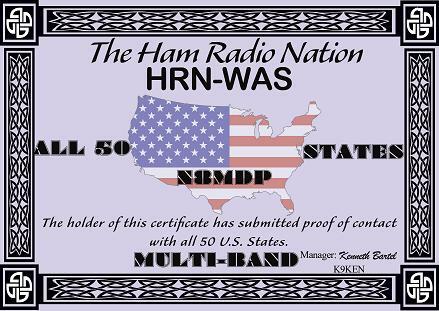 This is for working all 50 states on any band and using RTTY mode. 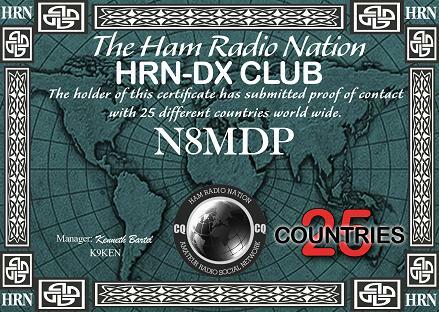 This was an award offered by Ham Radio Nation (www.HamRadioNation.com). This is for working all 50 states on any band and mode. Just need Zones 22, 23, 26, 29, and 34 to have worked all zones. 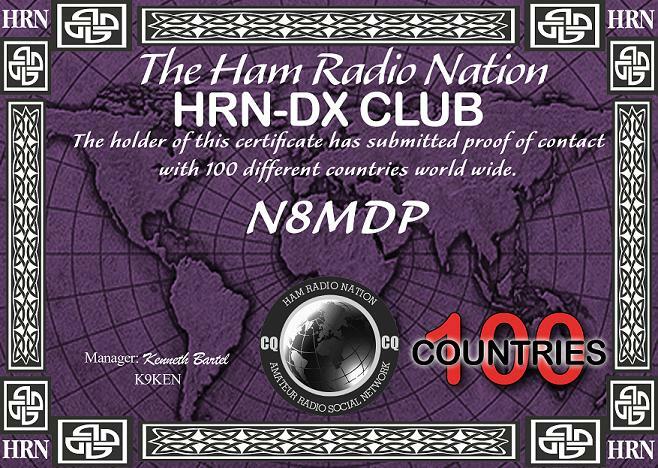 This was an award offered by Ham Radio Nation (www.HamRadioNation.com). 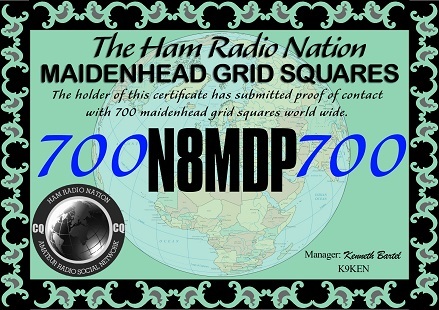 This is for working 700 different Grid Squares around the world. This was an award offered by Ham Radio Nation (www.HamRadioNation.com). 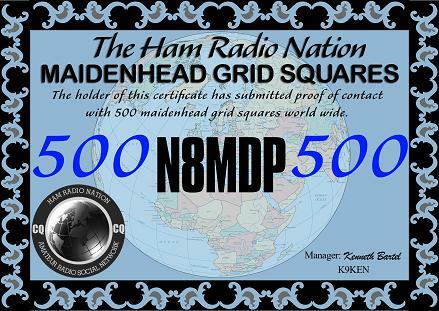 This is for working 600 different Grid Squares around the world. 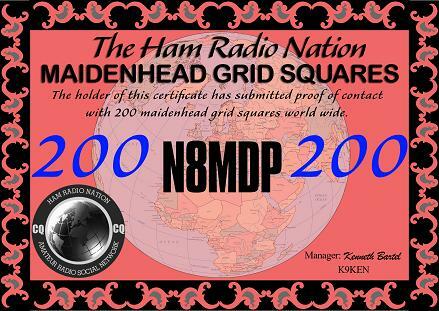 This was an award offered by Ham Radio Nation (www.HamRadioNation.com). This is for working 500 different Grid Squares around the world. This was an award offered by Ham Radio Nation (www.HamRadioNation.com). This is for working 400 different Grid Squares around the world. This was an award offered by Ham Radio Nation (www.HamRadioNation.com). 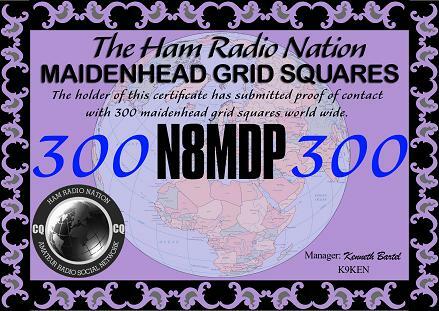 This is for working 300 different Grid Squares around the world. 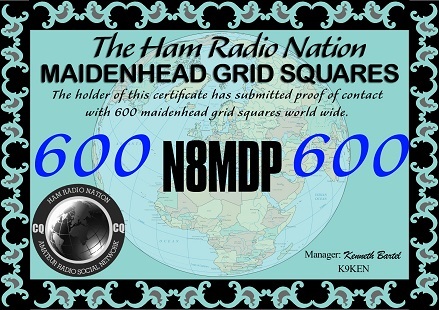 This was an award offered by Ham Radio Nation (www.HamRadioNation.com). This is for working 200 different Grid Squares around the world. 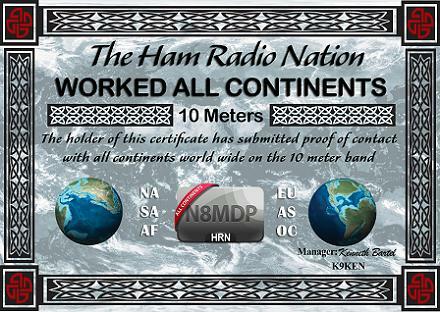 This was an award offered by Ham Radio Nation (www.HamRadioNation.com). 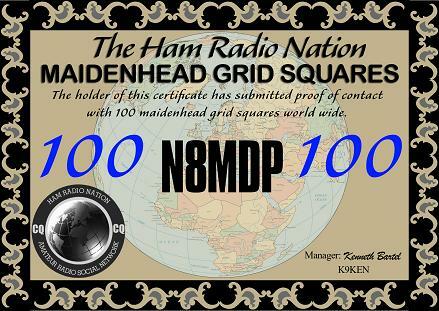 This is for working 100 different Grid Squares around the world. © 2019 , Jonathan Tucker N8MDP. All Rights Reserved.